New Liturgical Movement: EF Mass and '24 Hours for the Lord' at St Stephen's, Portland, OR - December 9th and 10th. 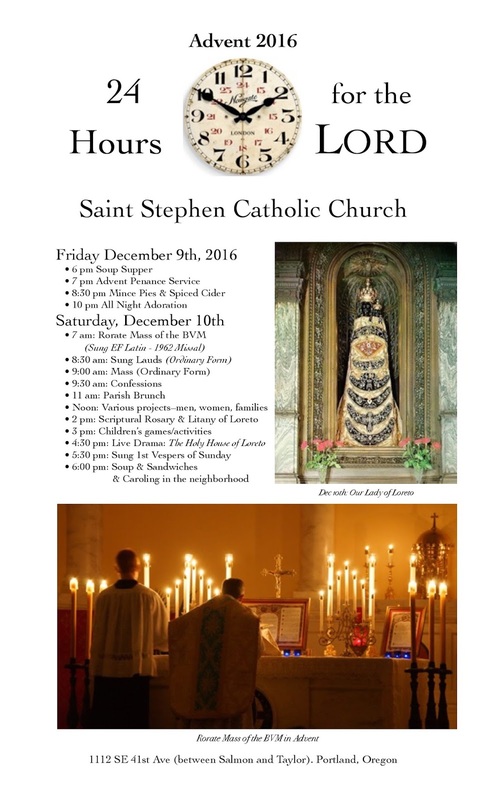 EF Mass and '24 Hours for the Lord' at St Stephen's, Portland, OR - December 9th and 10th. St Stephen’s parish in Portland, Oregon, is hosting a 24 Hours for the Lord as an Advent penance service, beginning at 6 pm on Friday the 9th with supper, followed by all-night adoration, and an EF Rorate Mass at 7 am on Saturday the 10th. There will also be sung Lauds and Vespers, confession, adoration and a recitation of the rosary and Litany of Loreto.